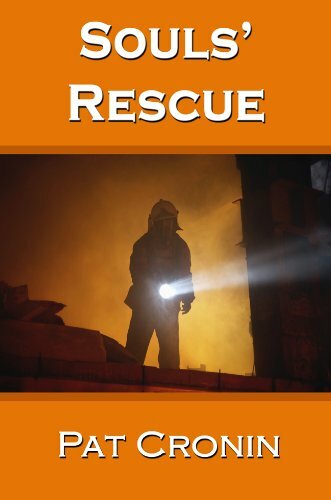 Souls' Rescue by Pat Cronin, a Goldie Award-winning co-editor of Blue Collar Lesbian Erotica. Kelly McCoy is a fourth generation firefighter who relocated from New York City following the events of 9-11 to Cincinnati, Ohio. Kelly meets Talia on the job when an accident threatens Talia's life and Kelly is the right person for the rescue. Following the rescue, Kelly continues to follow Talia's recovery and Kelly's persistent presence during Talia's recovery leaves them open to explore the possibility of a deeper relationship. The most poignant message in this story comes from Talia dealing with her body image and how that affects her self-esteem and what she believes are her limited choices in finding lasting love. Both her mother and her ex-girlfriend feed on Talia's lack of self-esteem which provides the fuel for conflict between Kelly and Talia in their fragile relationship. I would like to have read a more raw exploration of Talia's body image and self-esteem. There was more material to work with there and it would have added greater depth of emotion and conflict to the story. The book contained more typos and grammatical errors than I generally find in a published work. For some, that would heavily affect a reader's ability to enjoy the story. For me, I just mentally fixed the mistakes as I read and moved on. But that's not a license to be sloppy. I chose to read this book due to Melissa Grace's Challenge #1 on Facebook's Group, Lesbian Books, writers, readers. I'm very happy with my selection. Pat Cronin, I give you three and a half stars for Souls' Rescue. It was a fast read and a sweet story. Additional depth and improved copy would have easily brought it up to five stars for me.